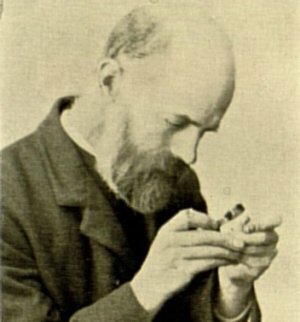 Over 1000 of William Linton's specimens are documented on the Herbaria@Home website. William Richardson was the youngest son of the Rev. Henry Linton, vicar of Diddington, and Charlotte née Richardson. From 1856 his father was rector of St. George-le-Bailey, Oxford and an honorary Canon of Christ Church, Oxford. William was a pupil at Repton School, Derbyshire, before joining Corpus Christi College, Oxford as an undergraduate. On graduation he moved to London as a curate and spent a decade as a tutor at the Church Missionary Society college in Islington. In 1886 he was appointed vicar to the parish of Shirley, Derbyshire. Although initially more interested in geology, conchology and climbing, his interests eventually converged more with those of his brother Edward. He became an active member of the Botanical Exchange Club and, with Edward, produced sets of willows, brambles and hawkweeds. 1850 April 2 : Birth William Richardson Linton was born at Diddington, Hunts. 1862 September : Repton School The Repton registers show that William was a pupil at this Derbyshire school until July 1869. 1869 October : Oxford He was a student of Corpus Christi College, Oxford University. He was awarded a B.A. in 1873 and M.A. in 1876. 1874 December : Holloway He was ordained by the Bishop of London as a curate of St. Paul's, Upper Holloway. 1876 : Tutor He took the post of tutor at the Church Missionary Society's College, Islington. 1881 : Palestine He undertook an expedition to Palestine with Rev. A. G. Girdlestone. 1886 : Shirley He was appointed vicar of the parish of Shirley, near Ashbourne, Derbyshire. He was to remain the incumbent here for the rest of his life. MARRIAGES Jan. 26, at St. Peter-le-Bailey, Oxford, by the Rev. Canon Capel Cure, Rector of St. George's, Hanover-square, assisted by the Rev. Francis J. Chavasse, Rector of the parish, the Rev. William Richardson Linton, M.A., Vicar of Shirley, Derbyshire, son of the Rev. Canon Linton, of Stirtloe, Hunts, to Alice, eldest daughter of the late Rev. Canon Shirley, D.D., Professor of Ecclesiastical History in the University of Oxford. 1905 : Publication An account of the British Hieracia. London.